The Baths is located at the street of Svartmangatan 20-22 in old town of Stockholm. This small bathhouse has showers with porcelain tubs, sauna and pool. The baths are available for rent between 1.30-9.30 pm, only on Saturdays. Mon, Thurs for the female and Tues, Fri and Sunday for the male. We have open during eastern as usually days ! The Baths are open between 5pm to 8.30 pm during the school semester. The entrance close at 8 pm. Please note! We ONLY accept cash no cards at the baths! Reduced price applies for: students, unemployed, retired. Status verification required. Membership of the Storkyrkobadarna has the opportunity to buy the Punch-Tickets. NOTE! Do not forget to pay your fee for 2019 if you want to purchase a Punch-Tickets. Soap, Schampoo and soda/mineral water are available at the entrance. Towels are available for rent. You can also get massage from our competent masseur ! The unique Storkyrkobadet can be rented by anyone, companies or private parties. bathhouse when you arrive at your booked date. For booking please call 08-20 90 27 between hours 5 pm to 8 pm ( Wednesdays closed ). You can also leave a message and we will call you back. Treat yourself, friends and family to the luxury of this different way of socializing with a few hours at the baths with our heated pool, the private tubs, sauna and beautiful historic architecture. The Bathhouse can be rented on Saturdays catering to private parties between 1:30 pm to 9:30 pm. The booking fee is 500 Sek (50€) and is non refundable in case of cancellation, the fee is due to be payed as soon as your booking is confirmed by us, the money is to be transferred to our account 450 40 13-6. Information and other questions about renting and regulations can be provided at 08-20 90 27. Old Town’s swimming school has classes for both children and adults. Our teachers are certified by the Swedish Lifeguard Society. essentials all the way up to more advanced techniques. The swimming school is open Wednesdays, Saturdays and Sundays. For more information please visit Gamla stans simskola. Storkyrkobadet is located at the street of Svartmannagatan 20-22 in the beautiful Old Town of our capitol Stockholm. The name has it’s origins from the brotherhood of monks that called themselves Black Brother Monks, this because they always wore black robes, they where a part of The Order of Dominicans that during the Middle Ages had a monastery where nowadays Storkyrko School and the Estonian School is located. The Monastery contained a church, it’s lush gardens, housing for the monks and a cemetery. The bathhouse itself is situated in the basement of the Estonian School and it’s arches descends from the 1750’s. This arched basement used to be a generous wine cellar and later a coal storage. The location also used to be the site of the St Nicolai School that during the 1890’s had it’s own baths complete with private metal tubs. In 1932 the Storkyrko School was built and the bathhouse that stand here today was founded with it’s own locker rooms, pool and private porcelain tubs with shower heads over each tub. Later in 1945 the sauna was added and the bathhouse was opened for the public conducted and run by the city of Stockholm. During the 1980’s the number of visitors declined due to Old Towns rise in residents and modernizing. The city then planned to close the baths. 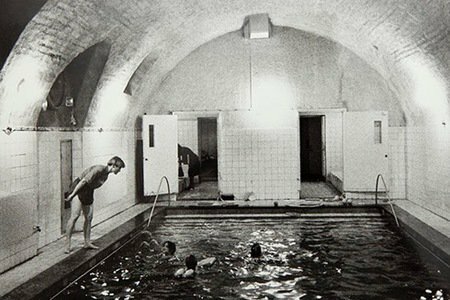 Then 1990 the society that called themselves ”The Happy Bathers” was formed, this club then ran the baths during the evenings and weekends. Later the club reorganized and was renamed to become the nonprofit society that runs it today calling themselves Storkyrkobadarna. In 1991 the society was awarded the ”Golden Boot” by the esteemed newspaper Dagens Nyheter for their cultural contribution to preserve the baths and for keeping them up and running without any funding other then the money coming in from guests attending the bathhouse. The society is also a part of and a member of Mäster Olofsgården in Old Town. Storkyrkobadet will have staff able to take calls during our open hours, between 5-8 pm Mon, Tue, Thu, Fri and Sundays.